This is the **SAME LENGTH** Stud Kit. See the below for a note regarding main bolt configurations on these motors. Introducing the upgraded Main Stud Kit (MSK) for the 2.7T and 2.8L 30 valve V6 made by ARP! Are you spending thousands of dollars on rods, pistons, machine-work, etc? If so, why trust all those parts to stock Main Bolts and risk your high HP setup spitting your crank out the bottom if the stock bolts fail? The higher possible clamp load of the main stud kits also reduce main cap walk at high rpm, thus extending the life of your engine. 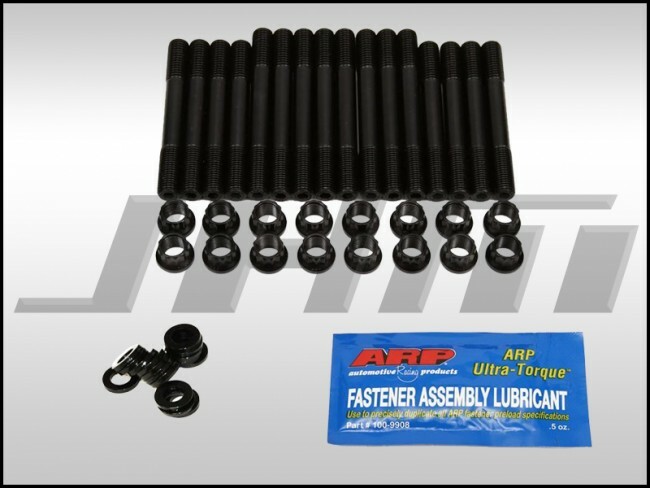 ARP has just released this Pro Series fastener kit. These main studs are manufactured from premium grade ARP2000 material that is rated at 220,000 psi tensile strength. This kit includes premium grade 8740 chrome moly 12-point or tri-square nuts, 8740 chrome moly washers, and 1/2 ounce pack of ARP Ultra Torque fastener assembly lubricant. ARP fasteners are centerless ground, heat treated prior to thread rolling and machning and designed to exceed the OEM fasteners in strength and durability. This kit secures the main bearing caps for increased output and rpm range providing a large increase in strength for motors revved past 7500rpm or 500+ HP. JH Motorsports also sells the Head Stud kits for this motor in addition to hardware for other Audi/VW motors. Please email us at sales@jhmotorsports.com if you don't see hardware for your engine. Note: Final torque specifications for this hardware is 65 foot pounds. These stud kits can be reused again and again, unlike factory hardware. NOTE: The 2.7t and 2.8l 30v V6 came with 2 different main bolt configurations from the factory. Some motors have all 16 bolts the same length while others have 8 long bolts and 8 short bolts. You must disassemble your engine to see which main bolts you have so you get the right Main Stud Kit (MSK). If all of the main bolts on your motor are the same length, this is the part you need. If you have different length bolts, please go back one section and add the "Main Stud Kit (ARP) for 2.7T, Different Length" kit to your cart.